When mobility is compromised walking and rehabilitation aids like braces and splints provide a supportive and protective method of assistance. There are many medical devices that assist with the treatment of conditions that limit flexibility of movement and walking. 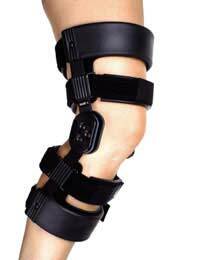 This also includes other forms of orthotic technology that also helps restore muscle function and natural response. Where limbs have been impaired the nerve-to-muscle response is compromised which results in an individual experiencing difficulty in walking. A condition like dropfoot, for instance, affects the natural lifting movement of the feet and dragging or a high step walking action usually occurs. Modern medical technology is now able to restore the functionality of the impaired limb with the use of a walking system that increases mobility and flexibility and allows the individual to regain independence. Some braces encase the limb and provide electrical stimulation that helps restores the natural function of the muscles. Because the movement signal to the brain is interrupted, without the use of a supportive device walking may remain difficult for individuals suffering from spinal cord injury, multiple sclerosis (MS) or other restrictive conditions. Using a walking aid can provide a new lease of life for individuals with restrictive or impaired mobility. Braces, splints, casts and other walking aids are designed to provide the maximum amount of comfort and flexibility, and also adapts to changes in walking speed or terrain. Some devices are cosmetically appealing and can be worn with any type of clothing, whilst other aids provide ease of wearing and removal. Splints are made in a variety of styles of plastic moulding. Some splints are lined with inflatable air cells that reduce pressure on the foot and ankle. Where continual support is required a soft, padded night splint can be worn to prolong Plantar Fascia stretch. Stretchy light-weight socks are another alternative. Although physical movement may be impaired or restricted in some cases maintaining some level of functional exercise helps improve mobility. Slow walking on a treadmill, for instance, can help increase muscle strength and flexibility. Older people may find that organised exercise classes offer easy-to-follow instruction in a range of movements. It is important to seek medical advise before embarking on any rehabilitation programme or exercise regime, particularly following injury or mobility restriction. Whilst using walking aids, for rehabilitation or ease of movement, it is important to ensure you minimise the risk of any further physical restriction. It is therefore important to regularly check that the walking aid in use fits personal requirements and does not compromise movement in any way. Ensuring the home environment is decluttered will also enable you to have as much freedom of movement as possible, without the risk of injury. Using handrails in the bathroom is also a good idea if this aids movement and creates more independence. The type of walking and/or rehabilitation aid required depends of the restriction of mobility that an individual experiences. Someone with more flexibility of movement could benefit from the support of a walking cane, whilst an individual with a greater impairment may require shoe splints, a walking frame, or a wheelchair to aid mobility. Understanding and accepting personal needs will ensure that you are able to find the most supportive method of assistance. @SHADI - I'm afraid we don't sell specific products, we are an advisory website. You would have to do some research to see whether this product was available through your healthcare system in Jordan. You would also have to have a medical consultation to see whether it might be suitable for your condition. good day i would like to inform you that's after seeing your sub product advertisement i found that's it could be so useful for my current medical situation taking into your account that i have (polymyositis)and i have some troubles in walking and running also climbing stairs and of course sitting and standing because most of the problem lies inmy bottom part of my body muscles which could cause me to fall down most of the times.................... therefore i would like you to advise me if your product is useful for my medical situation and if it is so.......... please reply to me about the price of the product and the possibility of shipping it to my home country (Jordan) which lies in the middle east. appreciate your good advice and cooperation faithfully yours.